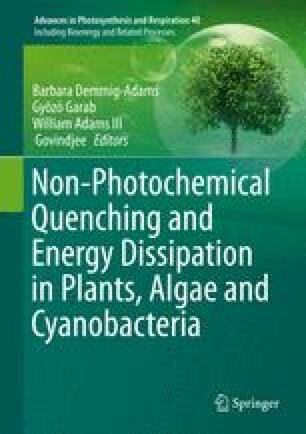 We discuss the de-excitation of electronically excited states of chlorophyll a, monitored via non-photochemical quenching (NPQ) of chlorophyll fluorescence, with respect to (i) involvement of the main light-harvesting complex of photosystem II (LHCII trimers) and (ii) a change in pigment properties following a change in the conformation of this protein complex. We suggest that LHCII exhibits dynamic behavior arising from a fundamental property of proteins, i.e., their intrinsic disorder. Photosynthetic pigment-protein complexes, such as LHCII, constitute complex environments. The pigments responsible for absorption and subsequent transfer of light energy are subject to multiple interactions in a highly heterogeneous protein environment. This feature gives rise to an intrinsic structural and energetic disorder of the pigment-protein complexes as well as complicated dynamics of excitation-energy transfer within the complexes. In particular, individual complexes show rapid and reversible quenching on timescales of milliseconds to minutes. We propose that plants employ this intrinsic capacity to reversibly switch between unquenched and quenched states to control the de-excitation (i.e., thermal dissipation) of potentially harmful excess excitation energy. Modulation of de-excitation by the local environment of pigment complexes will be demonstrated, with a particular focus on how this modulation manifests itself as chlorophyll fluorescence quenching of individually measured LHCII trimers. It will be shown how the results point to the concept of environmentally controlled disorder as a basis for the energy-dependent component of NPQ, i.e., that the intrinsic capacity of a pigment-protein complex to rapidly switch between light-harvesting and dissipating states can be controlled by the local environment of the complex. This can be explained by assuming that pigment-protein complexes are in an unstable equilibrium between different structural and corresponding emissive states, where subtle perturbations in the physico-chemical environment can shift the equilibrium to favor one or more of these states. As such, regulation of a disordered conformational nanoswitch provides a satisfying explanation for NPQ. This work was supported by the EU FP6 Marie Curie Early Stage Training Network via the Advanced Training in Laser Sciences project (T.P.J.K. ); EU FP7 Marie Curie Reintegration Grant (ERG 224796) (C.I. ); CEA-Eurotalents program (European contract PCOFUND-GA-2008-228664) (C.I. ); Project Sunshine, University of Sheffield (P.H. ); TOP grant (700.58.305) from the Foundation of Chemical Sciences, part of the Netherlands Organization for Scientific Research (C.I. and R.v.G. ); Netherlands Organization for Scientific Research program in Fundamental Research of Matter (The Thylakoid Membrane: A Dynamic Switch; FP126; 12.0344) (M.T.A.A. and R.v.G); Advanced Investigator Grant (267333, PHOTPROT) from the European Research Council (ERC) (C.I., T.P.J.K., and R.v.G. ).